Audrey Tally has two kids who attend Eagle River Elementary School; her son Colten is a 4th grader and her daughter Kenley is a second grader. During last month’s earthquake, their school sustained damage that closed it for the rest of the school year. That means Kenley and Colten will now go to two separate schools. That’s because K through 3rd graders are being relocated to Homestead Elementary and older kids will attend Birchwood ABC. Tally said her son, who is in a special education program, is having a hard time adjusting to the move. Tally also says that her two kids are very close, and the fact that they’re going to different schools is giving them separation anxiety. It’s a problem that Birchwood principal Michael Thomas has heard from several parents who have kids going to two different schools. He says getting a zone exemption – that would allow Tally’s kids to go to school together – would only work if the school wasn’t at max capacity for the grade. 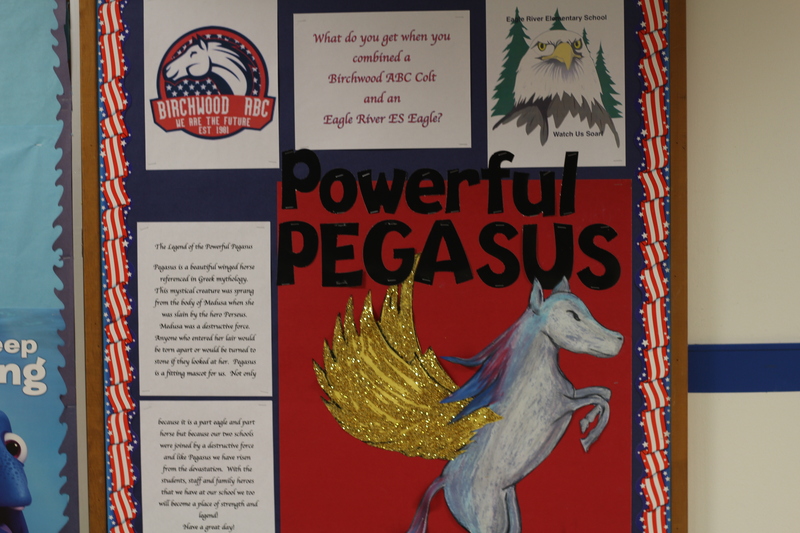 Thomas says he and the staff at Birchwood have tried to make the incoming students feel like they’re part of the school — they’ve even combined the two school mascots. Another issue the school is addressing is how to get students back to a state of normalcy after the natural disaster. Principal Thomas says that the school has been staffed with extra counselors to help get kids through the transition. The teachers have also been briefed about how to interact with their students after this unusual break. Tally says she’s happy with how accommodating the schools have been with the transition, whether it’s figuring out new bus schedules or the stream of communication from the district. While the Eagle River Elementary students settle into their new schools, the students at the other ASD school that needed to be relocated, Gruening Middle School in Eagle River, will begin their classes on Tuesday at their new school — Chugiak High.